Throughout NBA front offices, there's a run on Kyrie Irving intel. As teams deliberate and deliver trade offers to the Cleveland Cavaliers, executives are pursuing insight into Irving's character and habits, his leadership and late nights. The calls are flooding ex-Cavaliers executives and teammates, USA Basketball officials and teammates, and shoe reps. This hasn't been an exercise to decide whether teams want Irving. Most do. It's far more about these questions: How deeply do organizations want to invest in a trade for him? How much of a burden is he equipped to carry without LeBron James? And how much has he grown out of the immaturity of his early NBA seasons? Irving is the most unique player to reach the trade market in years. He plays the most impactful position in the NBA, has reached three straight NBA Finals and hit the biggest shot in the biggest Game 7 in a decade. He has two years left until he can opt out of his contract into free agency. Irving is 25 years old and a four-time All-Star, and there's reason to believe he hasn't yet played the best basketball of his life. What in the world is happening in The Land? So far, these are among the teams who've made offers to the Cavaliers for Irving, league sources tell ESPN: The San Antonio Spurs, LA Clippers, Phoenix Suns, Minnesota Timberwolves, New York Knicks and Miami Heat. There were approximately 20 teams that inquired with Cleveland upon the news of Irving's trade request, league sources said, but far fewer have registered legitimate proposals. More loom in the shadows, and many simply don't have the assets to make a deal happen. The Cavaliers want a package that resembles the 2011 Nuggets-Knicks deal for Carmelo Anthony -- young players, win-now veterans and draft picks, league sources said. For new general manager Koby Altman, this is a textbook way to open trade discussions. But for now, most Irving suitors are using the Timberwolves-Bulls trade model for Jimmy Butler, a scaled-down model of Melo's rich return of assets. Altman has shown himself to be savvy and deft, and his public and private posture has been to inspire belief that the Cavaliers feel no obligation to cave to Irving's trade request. The Cavaliers haven't ruled out bringing Irving to training camp. Nor have they ruled out starting the season with Irving and reaching the Dec. 15 date when free agents signed in the summer are eligible to be included in trades, league sources said. But most teams are dubious the Cavaliers will let themselves enter the chaotic circus atmosphere of Irving and James reporting to training camp together. Among rival executives, there's empathy for Irving's trade request. They see shrewdness in the move to beat James out of Cleveland. Owner Dan Gilbert pushed out GM David Griffin. James refuses to commit to a Cavaliers future. Now, Irving wants control of his career, and a trade gives him a distinct path. He can try out a new team for two years and decide to re-sign for a five-year maximum contract -- or walk in free agency in 2019. Altman and the Cavaliers haven't been overzealous on the phones. They've been deliberate in returning calls and canvassing for offers, trying to create the illusion that there's no urgency, no desperation. Whether it works to solicit more aggressive offers, they'll find out soon enough. By nature, Altman is a measured, unemotional pragmatist. Teams like talking to him, even if he has become more guarded in conversations since his promotion to GM. The freewheeling conversations that assistant GMs can have with each other typically become more muted upon becoming the top executive. 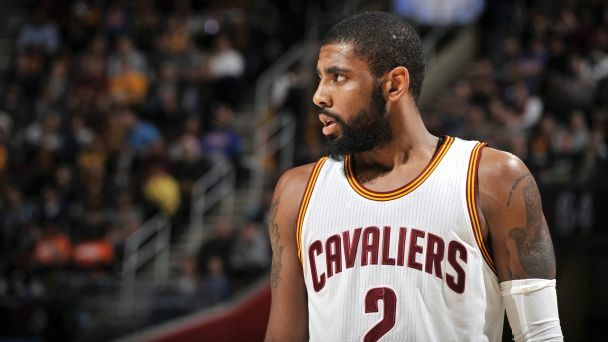 "I'll say this about [Altman]," one rival GM interested in Irving told ESPN. "He isn't overwhelmed. He's showing real poise." Truth be told, the Cavaliers' trade talks have been buoyed with teams getting back better, if not perfect, reports on Irving's growth, league sources said. Among the consensus: Irving has a history of late nights and partying, but there's no trail of missed practices, bloodshot eyes or hungover shootarounds. Most intel has come back that he has curbed those tendencies into his mid-20s, picking his spots more wisely. As a teammate, Irving can be moody, but most agree he's ultimately invested. He hasn't always loved deferring to James on the Cavaliers, or Kevin Durant in USA Basketball. This is the Kobe Bryant inside of Irving, and that's part of the DNA that can be a blessing and a curse. Teams believe he's smart, savvy and, above all, they believe he's a winner. "Go back through every team he's played on, talked to people involved or just study the results -- and it doesn't matter whether it was high school, college, USA development and national teams, and in the NBA -- and you see a pattern of him impacting winning," one Eastern Conference executive said. "There are questions about those first couple years before LeBron came back, but I think there were a lot of issues around there that were out of his control. That said, he didn't always help himself then either." An old teammate of Irving's told one Western Conference GM: "He's an animal. Forget whatever you hear about him off the court. Go get him." An elite Eastern Conference point guard told another GM in pursuit of Irving: "I don't like him personally, but I hate playing against him. I'd trade a lot to get him." Several suitors contend there are two teams with the best ability to make deals for Irving: the Suns and Boston Celtics. So far, the Suns are unwilling to include No. 4 overall pick Josh Jackson in a trade, league sources said. The Celtics are monitoring, but it's unclear how aggressive they'll get -- and how motivated the Cavaliers would be to make a deal with their fiercest conference rival. The Heat are willing to part with Goran Dragic and Justise Winslow as centerpieces for an Irving trade, league sources said. With the Cleveland-Miami history, there's little chance for a deal unless the Heat offered an overwhelming package. Gilbert may have unwittingly thrust pressure onto Altman during a Wednesday news conference, declaring "Indiana could've done better" in its trade package for Paul George. The Cavaliers have more leverage in a deal because Irving has two years on his contract to George's one. • 5-on-5: Who's to blame in Cleveland? • Is Kyrie following Kobe Bryant's lead? • Lowe: Which Kyrie trade will happen? • Vote: Smart for Kyrie to want out? • Pelton: Can Cavs win a Kyrie trade? Indiana had Irving on its board as the No. 1 target for George, league sources said. The Pacers had a willingness to do a deal straight-up, but Cleveland declined several times, league sources said. What did nearly come together was a three-way trade that would've sent Kevin Love to Denver, Gary Harris to Indiana and George to the Cavaliers. Here's where the deal fell apart, league sources said: Indiana wanted no protections on a future Cavaliers first-round pick. Cleveland balked, insisting the pick have lottery protection -- and Indiana moved onto the Oklahoma City package of Victor Oladipo and Domantas Sabonis. After the Boston-Brooklyn trade for Kevin Garnett and Paul Pierce, unprotected picks are rarely, if ever, transferred in deals. Nevertheless, Cleveland turned down those deals before Irving's trade request, and now the landscape on a package for him becomes far more complicated. The NBA has become a community in full scrutiny of Irving, a light that can be harsh in revelations. So far, Irving is standing up to it. The investment made in order to trade for him promises to be massive, and the process is well underway. How far do teams want to go for him? Who's Kyrie Irving without LeBron James? The answers promise to dictate the future of the Cleveland franchise, and even perhaps, the balance of power in the NBA.